EPA Moves To Regulate Toxic PFAS Chemicals The chemicals, which are linked to health problems, have contaminated drinking water and soil in many parts of the United States. Critics say the EPA is not acting fast enough to limit them. Original reporting on climate, environmental policy, and an energy system in transition. 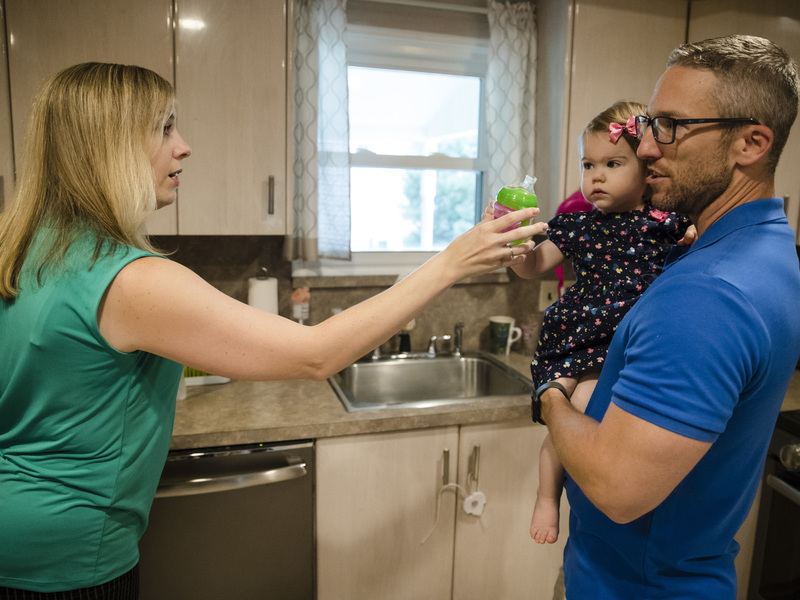 Lauren Woehr hands her 16-month-old daughter Caroline a cup filled with bottled water at their home in Horsham, Pa. EPA testing has found significant amounts of harmful PFAS chemicals in public water supplies in 33 U.S. states. The U.S. Environmental Protection Agency says it will begin the process this year of setting limits on two man-made chemicals that are linked to cancer and other illnesses, and are found widely in drinking water and soil. The agency's long-awaited plan — promised last year by former administrator Scott Pruitt — addresses chemicals that are part of a group known as PFAS, for Per- and Polyfluoroalkyl Substances. "It took groundbreaking efforts to develop this plan," said EPA Acting Administrator Andrew Wheeler at a news conference in Philadelphia. "This is the first time we have utilized all of our program offices to deal with an emerging chemical of concern." But critics say the move to regulate the chemicals "by the end of this year" amounts to yet another delay. In a statement, the environmental advocacy group Delaware Riverkeeper Network said the plan "lacks any sense of urgency and offers no timely relief to people exposed to these highly toxic compounds in their water." As part of its plan, the EPA says it has begun the process of listing PFOA and PFOS — two kinds of PFAS — as hazardous substances under the Superfund law. It says that will help communities deal with existing contamination and recover costs from responsible parties. Dave Ross, the agency's Assistant Administrator for Water, said EPA will also publish recommendations "very soon" on cleaning up the two chemicals in groundwater, an important source of drinking water for many communities. And he said the EPA is also looking at whether to regulate other chemicals in the PFAS family. PFAS chemicals have been linked to illnesses, including cancer, but there remain a lot of questions about how they affect people's health and in what doses. There was a big health study involving one form of PFAS in the Mid-Ohio Valley. From that and other studies scientists are comfortable saying certain diseases are linked to PFAS exposure, but they won't be more definitive than that. Acknowledging this lack of knowledge, EPA assistant administrator Ross said Thursday that the agency will step up its research into the chemicals' human health and ecological effects. "Our goal is to close the gap on the science as quickly as possible," he said. These chemicals have been around for decades and have been useful because they are good at repelling oil and water. They can be found in many products, including non-stick cookware, food wrappers, fabrics and fire-fighting foam. Manufacturers have agreed to stop using two forms of PFAS in the U.S. But it takes a long time for these chemicals to break down in the environment, which is why they remain a problem now. Some newer forms of PFAS chemicals are being used, and some people believe those are safer because they remain in the environment and our bodies for shorter periods. The issue gained more urgency in recent years as water suppliers tested for and found PFAS pollution as part of an Environmental Protection Agency program. The EPA required most water utilities to test for a list of PFAS chemicals from 2013 to 2015. In 2016 the agency lowered a non-binding health advisory limit for some PFAS compounds to 70 parts per trillion (ppt). Thursday, the EPA's Ross said the agency's latest testing showed that about 1 percent of public water systems had at least one sample with PFAS concentrations above that amount. Northeastern University and the Environmental Working Group have also created a map of contaminated sites and communities where PFAS has been detected in drinking water. Arguments for a stricter limit also gained traction after a report by the Centers for Disease Control and Prevention last year suggested PFAS chemicals may endanger human health at far lower levels than the EPA's non-binding limit. In the absence of federal action, and amidst this growing local concern, some states have taken it upon themselves to limit the use of these chemicals. A number of companies believed to be responsible for PFAS pollution face lawsuits. The state of Minnesota sued 3M over the toxins and settled for $850 million last year. Pennsylvania is one of a number of states that have been working to curb PFAS levels where soil or groundwater contamination has been found. The drinking water around Horsham is a concern because of the chemicals' long-term use in firefighting foam at nearby military bases. Blood tests on 235 residents of Horsham and two other townships by the Pennsylvania Department of Health last year found a large majority had levels of four PFAS chemicals that exceeded the national average, and that some of them had illnesses including elevated cholesterol, endocrine disruptions and cancer. Reporting in this story comes to us from StateImpact Pennsylvania, a public media collaboration covering Pennsylvania's energy economy.